The MetaCenter® Platform is the leading enterprise software platform to enable business and IT to collaborate in governing an organization's information assets. MetaCenter® allows business and IT staff to self service questions about their data and how it flows through the business and classify how it should be used. Leverage that knowledge to put your data to optimal best use. The platform’s capabilities are made possible by industry's only loosely coupled repository architecture. Instead of building a single normalized model, MetaCenter® builds independent models of each technology it scans using its ActiveLinx® Adaptors. The ActiveLinx® Adaptors are engineered to connect to a wide variety of metadata and technology sources and collect a model of the metadata in each. This approach reduces the total cost of ownership over competing solutions by up to 80%. The process is fully automated and can easily be validated. The MetaCenter platform also provides best in class extensibility to enable organizations to customize the platform as needed. No programming is required. Users rapidly amass details about enterprise systems, databases, data integration routines, reports, and many other information assets across the organization. Piece-by-piece a complete record of what data is created and consumed across the business comes to light. Achieve simplicity by managing distributed information assets across your dozens of technologies, including business intelligence, Hadoop, database, data modeling, data integration, data quality applications, and web services. Get your application specific information easily from one unified view. Furthermore, increase your efficiency with advanced search capabilities. 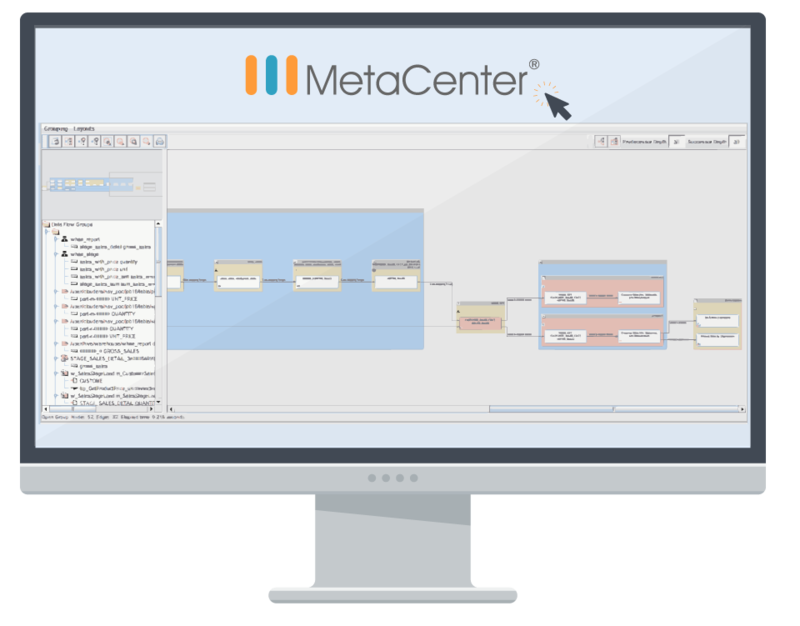 MetaCenter is built 100% in JAVA, uses a web-based three tier architecture, and runs on non-proprietary relational databases. We use the Object Management Group’s (OMG) Meta-Object Facility (MOF) and Common Warehouse Metamodel (CWM) standards. Additionally, MetaCenter offers support for big data solutions (like Hadoop and MongoDB), while our web service and URL based APIs easily integrate with your other systems and reporting platforms making your data infrastructure totally seamless. MetaCenter can be used by all the key players in your organization with the use of the software’s robust security framework. Using feature level or group-based privilege or role management, allow even your data stewards and system administrators to manage and administer right from the web based portal. Integrate with Single Sign On systems or Active Directory for authorization and authentication. Want powerful analytics? MetaCenter provides visibility into the areas of most importance to you, while giving you the reporting tools your need. Utilize best in class search capabilities and interactive graphical data lineage reports. Understand cross-organizational traceability and the impacts of proposed changes to systems across the enterprise. Drill down to use mapping view analysis and uncover how data elements are transformed as they move through your ETL processes. Collaborate across teams and/or your organization to document standards and processes. Easily build business glossaries or a data dictionary. Document business rules and data standards, regulatory requirements, corporate policies and procedures, technical infrastructure, and human resources. MetaCenter was built with the end user in mind. The intuitive, web-based user interface has built in workflow support and captures the user’s commonly referenced reports, search queries and information assets in a simple dashboard. Data Advantage Group provides quality customer support through their integrated and searchable online help system and real-time support services. metadata management and data governance initiative?